Abstract: We present our approach to perform and analyze immune system–cancer cross talk on chip experiments. Flanking in-vivo and in-vitro experiments with on chip co-cultures of primary human PBMC, immune cell subpopulations or murine spleen cells with melanoma, breast and colorectal cancer cells allowed us to test the on-chip model and to extract meaningful kinetics and behavioral data in the microfluidic controlled environments. The experimental setup allowed us to describe the effects of drugs or genetic modifications on the cell population crosstalk, highlighting or confirming important mechanisms in boosting the immune response against cancer. 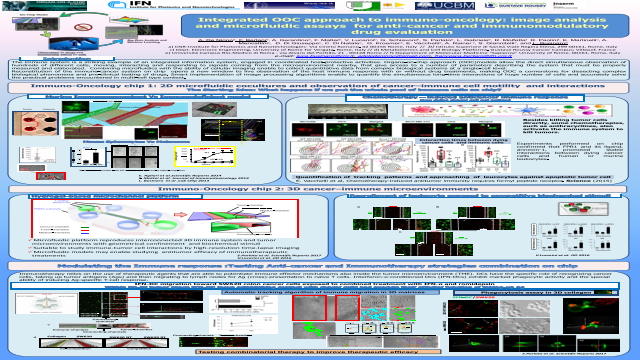 Our vision is that modern microscopy and on chip immune system reconstitution represent the needed bridge to link biology to advanced mathematical methods developed in complex system physics and to numerical simulation, allowing the development of integrated “cybernetic” models able to explore fundamental biology, and to tackle critical issues of drug testing with impact on clinical trials.Summary: The immune system is a striking example of an integrated information system, engaged in coordinated host-protective activities. Organs-on-chip approach (OOC)models allow the direct simultaneous observation of hundreds of different cells, moving, interacting and responding to signals coming from the microenvironment nearby, that give access to a number of parameters describing the system that must be properly measured and elaborated.References: 1. Chemotherapy-induced antitumor immunity requires formyl peptide receptor 1. Erika Vacchelli, Yuting Ma, Elisa E. Baracco, Antonella Sistigu, David P. Enot, Federico Pietrocola, Heng Yang, Sandy Adjemian, Kariman Chaba, Michaela Semeraro, Michele Signore, Adele De Ninno, Valeria Lucarini, Francesca Peschiaroli, Luca Businaro, Annamaria Gerardino, Gwenola Manic, Thomas Ulas, Patrick Günther, Joachim L. Schultze, Oliver Kepp, Gautier Stoll, Céline Lefebvre, Claire Mulot, Francesca Castoldi, Sylvie Rusakiewicz, Sylvain Ladoire, Lionel Apetoh, José Manuel Bravo San Pedro, Monica Lucattelli, Cécile Delarasse, Valérie Boige, Michel Ducreux, Suzette Delaloge, Christophe Borg, Fabrice André, Giovanna Schiavoni, Ilio Vitale, Pierre Laurent-Puig, Fabrizio Mattei, Laurence Zitvogel, and Guido Kroemer. Science (2015) 350(6263):972-8 DOI:10.1126/science.aad0779.